President Chris is away this week. Presidential Messages will resume on his return. Tony opened the meeting. During his address Tony mentioned he has been a member of Rotary for 20 years and 8 months. A movie night as a fundraiser for Polio Plus will be held on 1st November at the Palace Cinema Fortitude Valley. We are invited. Tony mentioned the possibility of Charles Teo AM (Neurosurgen) being a guest speaker. Denise stated an opening for this possibility will not be until 2019 and given the high profile of Charles Teo, the event should be well promoted. Cameron discussed RCOB’s contribution to the Drought Relief Appeal. The club will conduct a stall in the McArthur Centre (Brisbane CBD, Queen St) on 17,18,19 October 2018 (Wednesday, Thursday and Friday) between 10.30am and 2.30pm each day. It is expected the stall will be staffed by 2 people each day, and others will provide lunchtime relief. The plan is to have 40 members by 31 Dec 2018. Currently, there are 35 members and Dymphna Muir’s application yet to be approved. Keith highlighted an article in the September 2018 issue of Rotary Down Under profiling the club’s initiative to define the strategic plan. The success of this initiative was largely due to Daniel Vankov’s drive to formulate a planning strategy for the longer term, beyond his term as president. Keith called for membership nominations to several committees. Type I is when we give money. Type II when we fundraise. While we are lucky to have the PAF and can go for bigger Type I we have to be careful because we can easily deplete PAF. More focus should be put into Type II when considering Type I, i.e. if the project is good then fundraising should not be an issue. We shall also be looking at putting money into the PAF not only getting them out. There are also Type III projects, which do not require money and are fun. We have done some in the past and we shall pay more attention if opportunities for such arise. Chair for the day, IPP Daniel Vankov opened the meeting with grace and toasts, and then went on to welcome our many guests. Welcomes went out to Katie Stephenson who has recently moved to Brisbane from Darwin and is evaluating Rotary as an option to continue community service in Brisbane, Paul Choy who has already been accepted for membership of the club but who gets to be a guest until his induction in the next few weeks, our guest speaker, Professor Ross Young, Executive Dean of the Faculty of Health at QUT, Brendan Cox, CEO of Legacy in Brisbane, Heath Mackay from QUT, Leanne Butterworth from Lose Your Mind, Sophia Arkinstall from the Springfield City Group and Jacqui Page, former RCoB Rotarian. Chair Daniel then invited VP and acting President Keith Watts to the podium for the weekly presidential review. Keith reminded members that there would be no meeting on 1st October due to the public holiday, but that instead next week on Friday 5th October there would be a Rotary BBQ at Mark Wiliams' place. Details of how to register and get there are on the website and will be sent to all members in an invitation shortly. 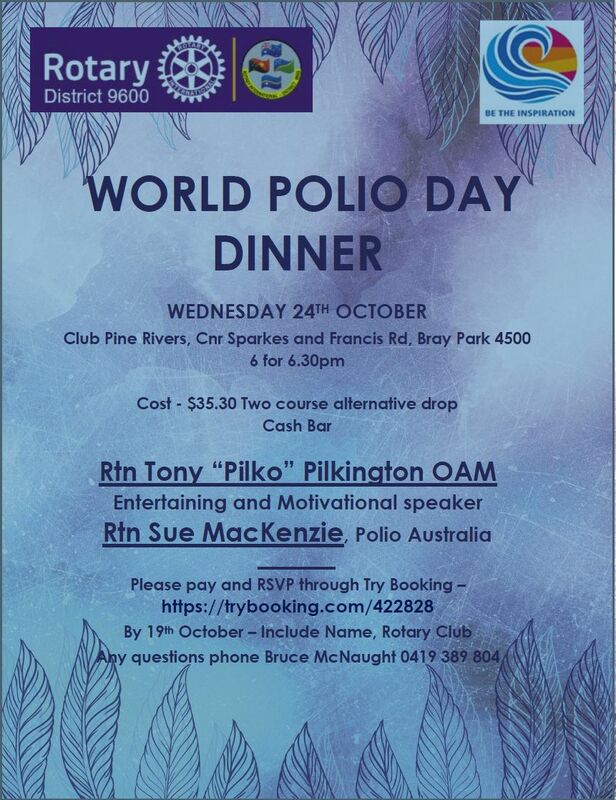 Keith also reminded members that our own Tony Pilkington would be keynote speaker at the World Polio Day dinner on 24th October and that it would be good to see a good turnout from the club to show support both for Tony and for Polio Plus. Click on the date claimer picture above to register. Keilt announced that the membership applications from Paul Choy and Dymphna Muir had been officially accepted by the club and that their induction could happen as soon as President Chris returns. Chair Daniel then called for spots. Denise Schellbach reminded members and guests that World Mental Health Week will be held next month from 7th to 13th October. Cameron Gibson gave members and guests an update on the drought aid project. The Rotary Club of Brisbane will be collecting donations for to aid drought-affected farmers from 10:30am to 2:30pm on Wed 17th, Thu 18th and Fri 19th October at MacArthur Central in Queen Street, Brisbane. All donations collected will be matched dollar for dollar from the Rotary Club of Brisbane's own foundation and donated to the Western Queensland Drought Appeal which distributes $250 vouchers to farmers suffering from the prolonged drought in Western Queensland which can be spent with local businesses. Cameron is organising the stall and asked both for help with running the stall and for donations from members. 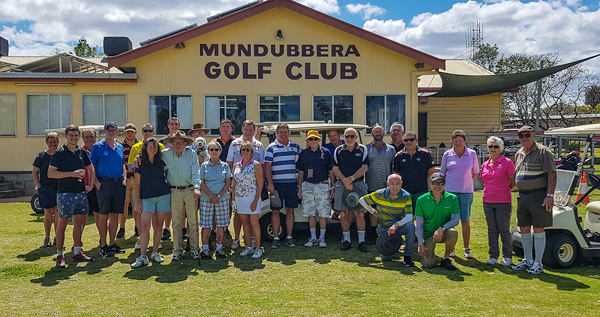 Mark Williams gave a quick report on the Burnett Cup Golf day held in Mundubbera over the weekend. 7 teams of 2 from the city competed against teams from the country and the result was that Country won by 4.5 to 2.5 matchplay rubbers. More importantly, $1600 was raised for mental health projects and Keith Watts played so well that he was accused of burglary by the captain of the country team. As a committed Rotarian himself, team captain Peter Hunsley called out Keith's handicap as being in violation of the first clause of the 4-way test. 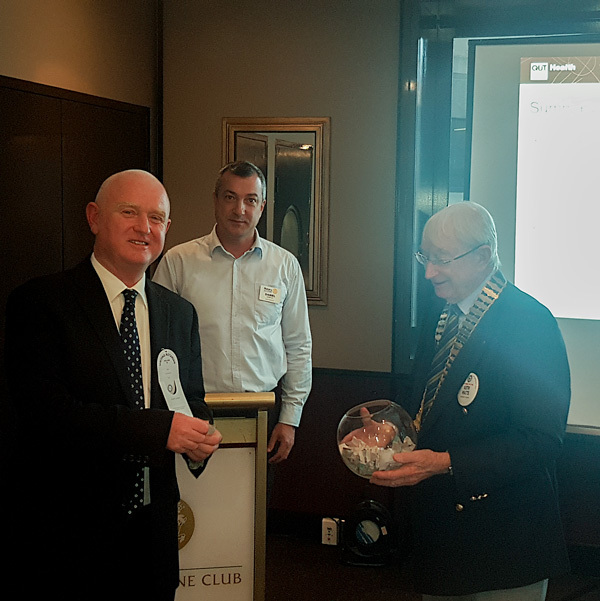 Daniel Vankov alerted members and guests to an upcoming article in Rotary Downunder highlighting RCoB's cooperation with CARRS-Q and QUT for the benefit of young drivers. This makes 2 articles in as many editions. Daniel also informed members that the 2019 International Women's Day Breakfast featuring Professor Margaret Sheil, VC of QUT and Councillor Adrian Schrinner, Brisbane Deputy Mayor as keynote speakers was confirmed for 6th March and that the United Service Club venue had been booked. Ticket prices have been set, and members will be offered "first bite" on the limited tickets available. Chair Daniel then invited Brendan Cox, CEO of Legacy Brisbane to talk a little about Rtn Luke Marshall's contribution to Legacy. This year, Legacy held the inaugural Canungra Corporate Challenge to raise funds to care for the families of service personnell who had been injured in service. Luke and his company took part, and between them raised about $6000, $2600 from Luke's personal efforts. It should be noted that Luke took part wearing a dress for extra donations. More details and photos here! After a short time for fellowship and a pretty decent lunch, Chair Daniel invited our guest speaker for the day, Professor Ross Young to deliver his presentation. The presentation was absorbing and provoked quite a lot of questions and discussion. More detail can be found in the article below, and members can access a PDF of the presentation here (requires login). There was no time for a sergeant, so Professor Young was asked to draw the raffle. Max Winders held the winning ticket but couldn't find the joker. Guest Speaker Professor Ross Young draws the raffle under the watchful gaze of Chair Daniel and Acting President Keith Watts. Acting President Keith closed the meeting at 1:50pm. Dan Williams has been organising an annual charity golf day in Mundubbera since 2013. The initial motivation for this event was the disastrous flood of 2013 that devastated low-lying areas of Mundubbera and caused great hardship. The Burnett Cup charity golf day was a gesture of solidarity with the bush by some people from Brisbane and some money was raised for flood relief as well. The event proved so enjoyable that it has been held each year since, with different charities relevant to rural Queensland such as Care Flight and Sisters Inside being chosen each year. The Rotary Club of Brisbane has teamed up with Dan since 2017, with focus being placed on mental health issues in general and rural mental health in particular. It was with this background that 12 Brisbanites including 6 from the Rotary Club of Brisbane trekked to Mundubbera on the 22nd of September (or the day before) for the Burnett cup, this time to seek revenge for the loss they suffered last year, have some fun playing golf and raise some cash for the Royal Flying Doctor Service Mental Health Unit and Australian Rotary Health. As most of us know by now, Districts 9600, 9630 and 9640 are being combined into a single large district. The District Governors have asked that all members receive the communication below detailing where the process is up to now. Following your votes earlier this year, Rotary International has approved the merger of our three Districts to form District 9620. The exception is the Rotary Club of Glen Innes which moves into District 9650. Our new District, 9620 will come into effect from 1 July 2021. To enable the orderly transition from our three Districts into one, we have established a Transition Leadership Team that will be responsible to the District Governors of the three Districts for planning for and transitioning to the new District 9620. We have attached a detailed Transition Planning Team Structure Document that details the teams, the tasks and the team responsibilities for your information. There are six Action Teams with responsibilities for Administration and Governance, Youth Programs, The Rotary Foundation, Services, Membership and Public Relations and Training. Over the coming months these teams will be establishing working committees comprising members from each of the three Districts to address the many tasks necessary to create the new District. There will be opportunities for you to be involved and/or to comment on the recommendations that come out of each of the teams before they are approved by the District Governors and Rotary international. Should you wish to provide input to any of the Action Team areas, we have provided contact details in the attachment. As you can appreciate, there are some urgent activities that must be completed to enable the teams to progress. These include establishing the Legal Entity that will be District 9620, establishing a Constitution and By-Laws and a process for selection of District Governors. We have established a top-level schedule that will enable these and other activities to be developed in a logical fashion and that Schedule is attached as Enclosure 2. Given the complex nature of the three Districts with Clubs located in two states and four countries, the tight schedule for the merger, and the associated legal requirements and agreements necessary to form the new District, we have determined that the best way forward is to proceed with a company limited by guarantee as the legal entity. This will be based on the current District 9600 model. A new Constitution and a set of By-Laws is currently being drafted and these will be circulated for comment shortly. Establishing the new entity will require approval of the Constitution and By-Laws by the members of each District. There will also be a requirement for some amendments to the existing Constitution and By-Laws of each District so that we can proceed with the election of District Governors for the Rotary Years 2021-22 and 2022-23 and an orderly transition to the new District by 1 Jul 21. Timings for these activities are shown in the attached schedule. A Transition website has been established at http://rotary9620.org to keep members informed and also provide opportunities for input. 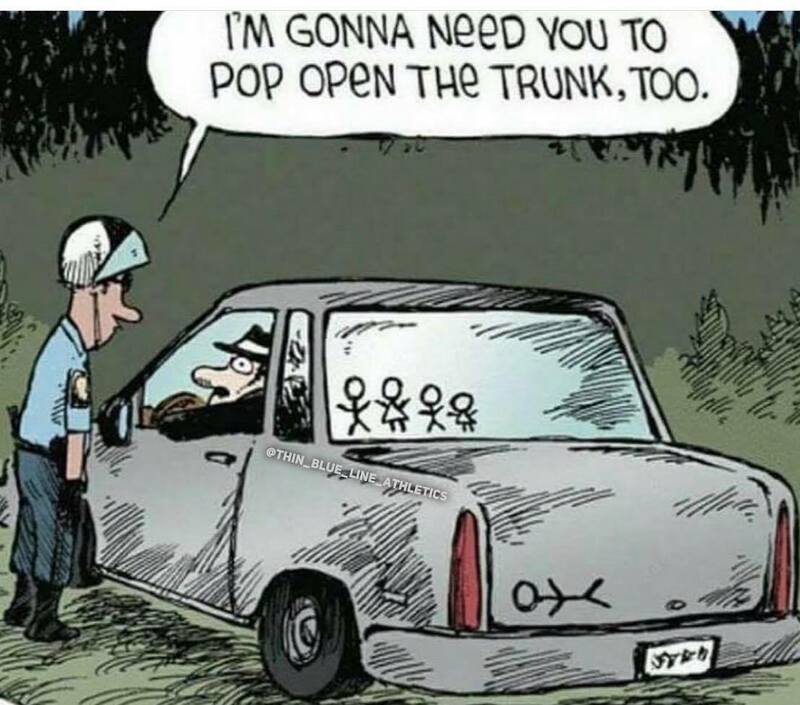 It, of course, is also a work in progress. The management structure for the District is still under discussion but the organisation Charts at Enclosure 3 provide details of the current proposed arrangements both for the Company Board and the District Leadership Team. Associated administrative processes and procedures will be developed as each of the Action Teams progress their various responsibilities. This process will be an open and transparent process and you as members of the District will have ample time for input and comment. We are in the process of producing a Communication Plan and as stated we have established a Transition Website that will provided up to date information on the re-districting progress. We value your input so please do not hesitate to contact any of us or the Action Team Leaders with your queries, concerns or suggestions. On my first day at the Chinese University of Hong Kong, a college senior invited me to the Rotaract Club of Chung Chi College. This small step introduced me to the wonderful world of Rotaract, where I strengthened my leadership and organizational skills while taking part in some amazing activities, including bringing smiles to the faces of people with Severe Acute Respiratory Syndrome, hosting a Rotary Youth Leadership Awards training camp, and helping charter a new community-based Rotaract club. 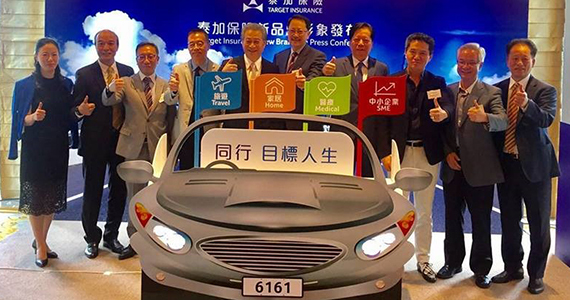 Joyce Lau’s Rotary experience helped her land a position with a major financial firm in Hong Kong. Four Rotarians serve on the board of directors. Having benefited so much from Rotaract, it was natural for me to join Rotary when I had the chance. But never would I have thought that Rotary would take my career to the next level. Three years ago, I received a call from Dr. Haywood Cheung, a past president of the Rotary Club of New Territories, which sponsored the Rotary club I belong to and the two Rotaract clubs I had previously been involved with. I was offered an opportunity to join his company, which is preparing to be listed in the Hong Kong Stock Exchange board as a financial controller. Some time later, I asked Dr. Cheung why I was chosen for this role. He said he had had more than a decade to learn what kind of person I was and he knew I was someone he could trust. 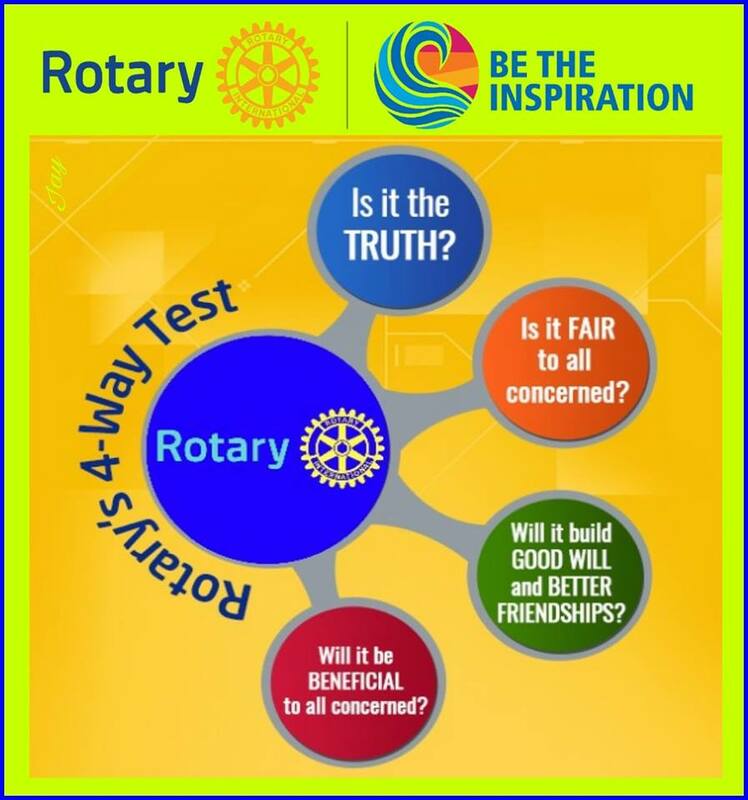 Indeed, in both my Rotaract and Rotary life, I have always tried to practice The Four-Way Test. I feel fortunate to work with other Rotarians as an accountant, and continue to serve my community and my Rotary district. My boss, as a Rotarian, constantly encourages me to take part in industry and professional organizations that further enhance my skills and business reputation. One of the clear benefits of Rotaract or Rotary is that it allows us to develop communication and leadership skills that makes us more attractive to employers. We become a highly-qualified pool of candidates, who also possess a heart for service. Rotary employers who recruit from this pool get trustworthy employees, but also get to use their vocational expertise to help young leaders build their careers. This ultimately strengthens membership in both Rotaract and Rotary. Surely, this is Rotary Vocational Service in action. Editor’s note: This is the fourth in a series of posts celebrating Membership Month. Learn more about Rotaract and explore the many benefits of Rotary membership in our Member Center. One of the ongoing challenges in Rotary is maintaining a healthy level of membership. My club of Haute Rive is no exception. We started the club in 2014 with 20 members, and despite the fact that we have gained new members since then, we’ve also lost a few. So much so that membership fell to just 18 as of 1 July 2017. Fortunately, our leadership team was proactive and began forming a plan to address the situation. As club president, some of the responsibility fell upon me to understand the situation. It was clear we couldn’t approach recruitment the same way we had been from the beginning, asking members to suggest their friends and business partners. We needed a more defined and deliberate strategy. I began looking into many different options, and we decided to pursue a couple of different strategies. We opened our meetings to guests from the community by deliberately organizing talks on topics that would interest non-members, like the environment, our laws and constitution, and current events. These gave people a no-risk opportunity to attend a Rotary meeting while giving us an occasion to share with them what we do. This proved to be successful beyond our expectations, and at the same time, enhanced the image of Rotary in our community. After much research, we also decided to pursue a satellite club. This required considerable planning and explanation, because there were many Rotarians in our district who did not know what these are — a group of members connected to the main club who meet at a separate time and location. But after much discussion and an extensive amount of info sharing, we had an enthusiastic group of people, and we formed a core team with the help of a Rotaract club we sponsor. As of June, we had organized the first satellite club in our district. With these strategies, and the hard work and determination of our members, we ended the year with a 100 percent increase in membership, and five more prospective members visiting our club. A club’s health is, of course, not just a question of numbers. But having more members does help create enthusiasm and increase participation in projects and events. In this journey, we developed quite a few tools that helped us implement our plan, including some slideshow presentations, answers to frequently asked question, and more that we would be happy to share with any interested clubs by contacting me at rotary@gajeelee.com. If you are willing to address your situation, and put in the time and research, it is possible to achieve a 100 percent membership increase. Editor’s note: This is the last in a series of posts celebrating Membership Month. Satellite clubs allow some of the members of a club to meet at a different time and location, while officially remaining members of the main club. If membership in the satellite grows sufficiently, it can break off and charter as a new club. Learn more about satellite clubs and find more membership resources.